eScan for Linux File Servers. With the significant increasing usage of Linux web servers across the globe, IT security is often considered as strength of the platform. However, the server can be compromised due to a poor security configuration. Threats such as usage of web server as a spam-sending relay, or as a source of malware and other such malicious activities are possible. Ensuing security of the entire server and services with a highest level of protection is required to avoid the risk of being compromised in order to protect your intellectual property and data. 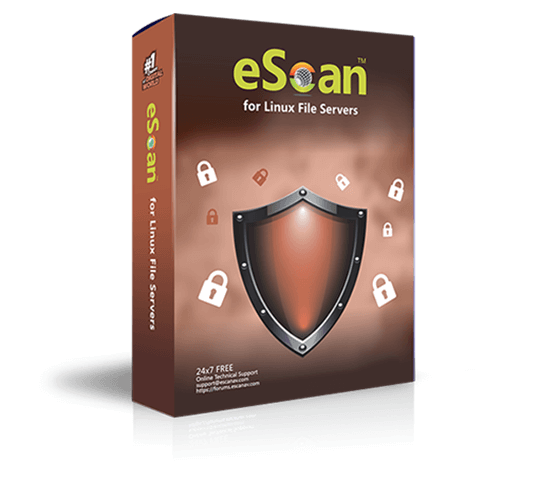 eScan for Linux File Servers is a reliable virus scanning software for workstations and servers running on Linux. It offers a complete and secure Anti-Virus Security Solution that detects and removes over 1,20,000 viruses, Trojans and other cyber threats. It scans files automatically so that viruses are quickly detected and removed. eScan for Linux File Servers has a menu that gives important information such as the date of virus signatures were downloaded, the Anti-Virus engine version and the total number of viruses that can be detected and removed. eScan for Linux File Servers comprises of a feature known as Monitor that allows you to configure settings such as the cache size, number of threads (files) that can be scanned simultaneously and set the maximum size up to which files should be scanned. You can also quarantine infected files. Other features include setting the quarantine path and excluding files with specific masks (like .pdf, .txt) from scanning. Monitor allows you to exclude specific directories from scanning. When infected files are detected, you can set the action to be taken. The actions that can be preset include renaming the infected file, disinfect the file and if that fails, either rename or delete the file, etc. You can also select specific file types for scanning. Different file types such as packed, mail databases, archived, plain mail, self-extracting archived files, etc. can be selected.